Detroit fire crews are on scene of a HAZMAT fire at a titanium factory on the city's east side. The fire started just after 2:30 a.m. at Global Titanium on Fier Ave., which is near the intersection of Mt. Elliott and 7 Mile. 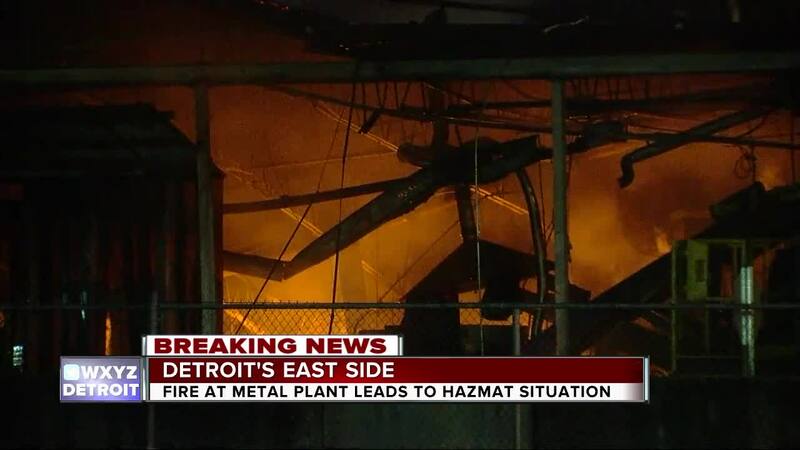 DETROT (WXYZ) — Detroit fire crews say three people were injured after an explosion at a titanium plant on the city's east side. The fire started just after 2:30 a.m. at Global Titanium on Fier Ave., which is near the intersection of Mt. Elliott and 7 Mile. We're told there was a fire and explosion in the building and one wall was blown out. Fire officials tell us there were people inside the plant working when the explosion happened. Officials say three people were injured and taken to the hospital. A 27-year-old man was suffering from nausea and vomiting, likely from smoke inhalation. A 46-year-old man had minor burns to his hands and a 45-year-old man had pain in his back, legs and face. All are not life threatening. According to the company's website, Global Titanium "offers a variety of titanium metallurgical products including ferrotitanium, titanium scrap, and titanium powder." The building is being considered a complete loss with all of the walls blown out. It's not clear what caused the fire but they are continuing to investigate.